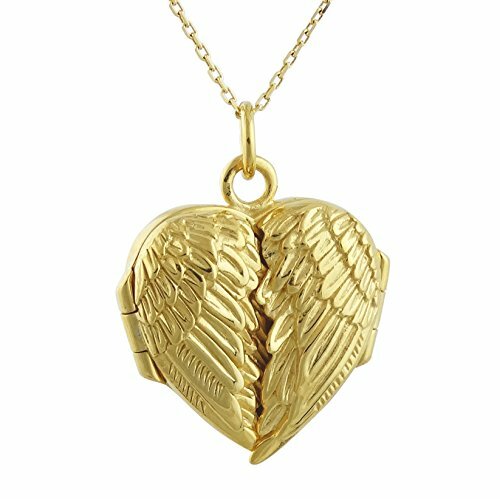 This beautiful 18k gold plated angel wing heart locket is made of solid .925 sterling silver and is stamped "925". The angel wings open up to unfold a special place in the heart to put a photo or trinket of a loved one. This locket is also available in silver. Please search our storefront for separate listing. Heart measures 20mm x 20mm (3/4" x 3/4"), not including the jump ring. The back of the locket is flat and can be engraved by your local jeweler for a small fee. Gold angel wing locket includes an 18" sterling silver cable chain plated in 18k gold. Angel wing locket arrives in a gift box. If you have any questions about this product by FashionJunkie4Life, contact us by completing and submitting the form below. If you are looking for a specif part number, please include it with your message.